A great festival…shame about the catering. If you invite scores of parents to a rugby club in the rain early on a Sunday morning you are going to sell a few sausage sandwiches. Some will have hangovers, some will have woken late and skipped breakfast and some will just see it as a chance to double up out of sight of their other halves. So when they run out before 9am, it makes you wonder what else may go wrong. Like our boys in the first game, they were wrong. Wrong passing, wrong defending, even scoring tries on the wrong line. It was a bad start. And it didn’t get much better after the half time break. Thanks to messy defence and a lack of cohesion we lost 4-5 against Reeds (we thought it was 3-5 or even 3-6 but the ref was certain it was 4-5. Either way it didn’t matter, we played badly and lost despite tries from Ned, Ben and Michael). 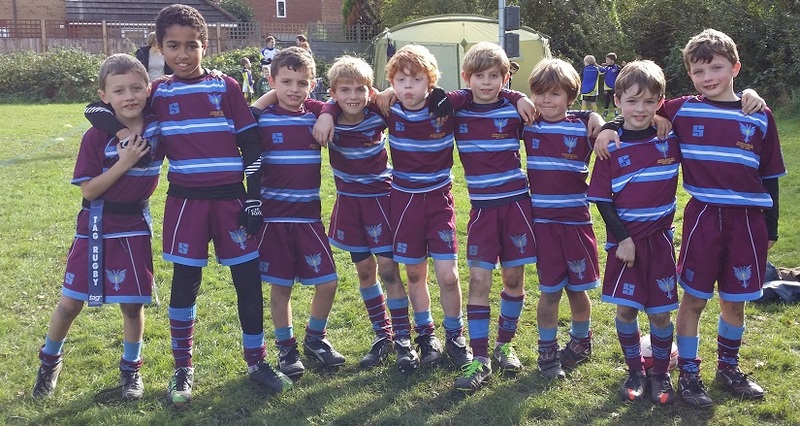 You simply don’t expect to see boys confusing the sideline for the try line at the U8 level. It seemed the day had just got off to the wrong start and we needed to wake everyone up. And then the sun came out. Jackets came off, spirits were lifted and so was the performance. The second match against Old Emanuel got off to a much better start. Their organised defence twice had us turning over possession after using up our 7 tags but we were also defending well and held them to a halftime score line of 1-2 in their favour. The second half started with Old Emmanuel running in a lucky try from the whistle, however William and Ben added to Chris’ earlier try and we were even at 3-3. But our efforts were to no avail as despite what we all believed was a try on the whistle from Noah T, the ref thought otherwise and we lost the match 4-3. Our third and final match of the day was against the hosts Esher. This was good as it meant their ref who had ruled over our first two matches would be replaced by one with whom we may have more luck. By now the boys had worked out that we would not be making it to the cup final – and there was no plate final. So this was their last chance for a win. With this thought in their minds they turned in a faultless performance through the entire match. They played with gusto and an intensity that that had been sorely missing all day. Esher struggled to get near our line before using up their 7 tags and our attacking was a series of long runs linked by accurate off-loads. Tries from Chris, Michael and two from William gave us a 4-3 win and ensured that although the boys would go home without medals or silverware (or a sausage sandwich) they would at least go home with a win. Quote of the day: It seems Wimbledon have again woken up late and saved their best rugby for the last match – Dan T.